Stormy waves, surf. Beautiful non-toxic watercolors on acid-free paper (140 lb) by young California artist Olga Tremaine. Natural colors. Original, I don't make copies. Stormy waves, surf. Beautiful non-toxic watercolors with thin white acrylic paint on acid-free paper (140 lb) by young California artist Olga Tremaine. Turquoise water and white foam. Bright colors. 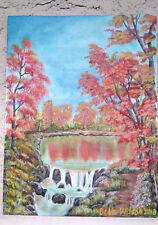 "Fall/Autumn by the lake" I love the colors of fall. I love how the colors dance in the air. It's good for the soul. Has a matte finish to protect it. Sunset on the Beach depicting beautiful sunset by the ocean. Coastal/Nautical addition to your wall art. Has a matte finish to protect it.Signed. Has a matte finish to protect it.Signed. "Beach Dunes". Coastal/Nautical addition to your wall art. Has a matte finish to protect it.Signed. Coastal/Nautical addition to your wall art. Has a matte finish to protect it. This is an original hand painting in acrylic 12 x 16 canvas panel of a sea turtle swimming. Coastal,nautical beach decor. Matted to protect it. Coastal/Nautical addition to your wall art. This is an original hand painting in acrylic 12 x 16 canvas panel of a flamingo. Distressed to give it an aged look. Coastal,nautical beach decor. Matted to protect it. "Paradise" depicts a crunchy wave crashing onto a rock on the shore creating beautiful foams on an island faraway. Coastal/Nautical addition to your wall art. Has a matte finish to protect it.Signed. Acrylic original, not print, hand painting. Crunchy wave on the beach. Matted to protect it and signed. This is an original hand painting in acrylic 12 x 16 canvas panel of Boats in the Ocean with a colorful sky. "Ocean Boats" depicts a nice view of the ocean and the myriad of colors in the sky dancing in the water. A friend who saw my paintings and who is knowledgeable about art said they are good. I love flowers and everything green and nature in general. I love painting flowers. They brighten everything they surround. BIG ORIGINAL Hand Painted Sea Turtles Ocean Scene Paperweight by Seneca Rock Art on a stone rock by Seneca! The different layers I painted really gives the effect of 3D. Everything I paint is always freehand. "Tropical Beach". Coastal/Nautical addition to your wall art. Has a matte finish to protect it. Original Acrylic Painting Beach Sand Shells Shipped with USPS Priority Mail. My original sailing boat painting will add a touch of whimsy to the walls of your nursery or kids room. My art is inspired by nature. I am always in awe with nature’s extraordinary creative force, spirituality and beauty! This is a print of the Round Island lighthouse which stands near the entrance to Mackinac Island. "Tropical Beach House ". Dreams are always free. 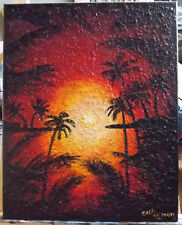 So I can paint my dream get away place while I am listening to the humming of the ocean. Coastal/Nautical addition to your wall art. Has a matte finish to protect it. "Tropical Island Beach" depicts an island beach away in the middle of nowhere, quiet, relaxed, overlooking the ocean with palm trees and tropical greens. Coastal/Nautical addition to your wall art. Has a matte finish to protect it.Signed. You will get (2)both paintings in the photos. Inspired by the beautiful coastal sea life of the Pan Handle and Panama City Beach. Coastal/Nautical addition to your wall art. Coastal/Nautical/Tropical addition to your wall art. Seahorse Painting Original Art with acrylics and Polymer Clay Seahorse,4x4” Shipped with USPS First Class Package. A charming sea horse art canvas to bring character to any wall in your house or office. 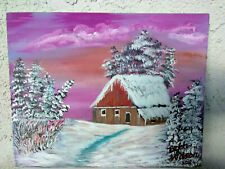 This quaint scene is created on stretched cotton canvas covered with polymer clay and acrylic paint accents. Edges are finished so you don't need a frame, just hang on a nail. It also would be lovely in your own frame. Painting measures 4 x 4" and a thickness of 1-1/4 inches. Wonderful housewarming gift for any beach lover. Coastal/Nautical addition to your wall art. Has a matte finish to protect it.Signed. Has a matte finish to protect it. Sunrise Fog Regatta - abstract original acrylic painting, by Ben Gertsberg. Sailboats are ready to sail into the open ocean, away from the hot sandy beach. Inspired by the beautiful sea life and wildlife of the Pan Handle and Panama City Beach. Coastal/Nautical addition to your wall art.